KEYC NEWS 12 (Dec. 24, 2018) – Nothing highlights the Christmas and holiday season like tradition. At Pub 500 in Mankato, a 15–year tradition continued with a performance from a Dixieland jazz band called the Blue Ox Jazz Babies. While some attend the concert before heading off to visit family, others make it a part of their agenda. A few blocks down the road in Old Town, the Coffee Hag was hosting their own holiday music event featuring harpist Amy Korteum, which is another Mankato holiday tradition going on five years running. 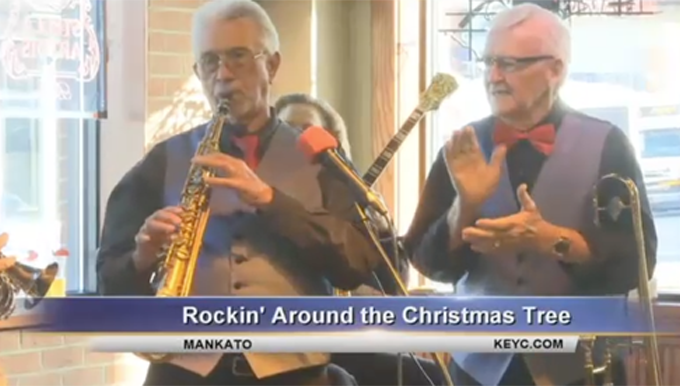 Both venues plan to continue bringing some holiday cheer on Christmas Eve for years to come. Until then, you’ll have to wait another year to find out. 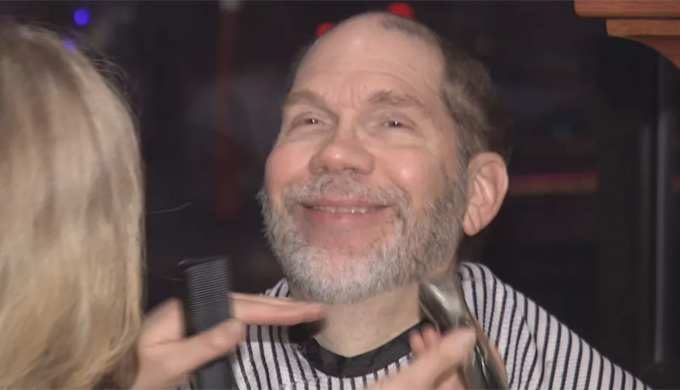 MANKATO FREE PRESS (Nov. 30, 2018) – Joan Hurley shaves Bob Boelter at Grow Mankato’s 2018 Mustache Bash event at Pub 500 Friday night. The Mustache Bash is the culmination of a month-long effort to educate and raise funds for men’s cancer. KEYC NEWS 12 (March 27, 2018) – Leadership, community impact and dedication. “We just want to do our best, and to believe that we are here for our community,” YWCA’s Women of Distinction 2018 honoree Dr. Caroline Baerg said. Those are just some of the qualities highlighted each year during the YWCA’s Women of Distinction Awards since 1973. “They’re coming from very different places. They have very different traits and skill sets and passions,” Barb Dorn, executive director at YWCA in Mankato, said. With over 140 women recognized over the past 45 years, they all have one thing in common. “They lead, and they all lead very, very well,” Dorn said. Five local women were recognized for that and more at this year’s award ceremony. “You live your life and you try to do what you think is right, and you never really know if you’re really making a difference,” YWCA’s Women of Distinction 2018 honoree Sue Keithahn said. The event also serving as a reminder that they’re doing just that. “They have changed things for the better. They have volunteered. They have worked hard. They have affected the lives of many more people than we can imagine,” Dorn said. As they continue to inspire and lead as examples in the community. “The difference between propelling ourselves into the stratosphere or kind of remaining the status quo. I think to grow, it’s time to propel,” YWCA’s Women of Distinction 2018 honoree Sarah Richards said. One local business is also recognized each year. Pub 500 was honored with this year’s 2018 Distinctive Difference award. 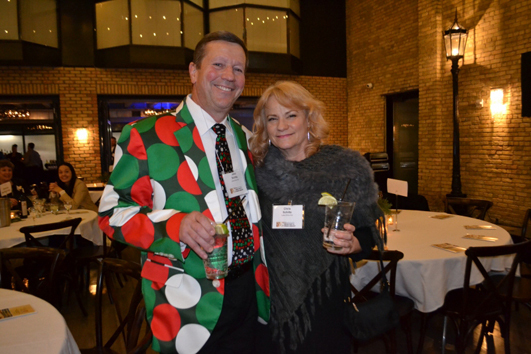 FOOD SERVICE NEWS (Dec. 10, 2017) – Nothing screams, “holiday party” like John Schiltz’s red-and-green polka-dot suit jacket and snowflake tie. Sure, it wasn’t even Thanksgiving yet, but the owner of Lake Elmo Inn and the president-elect of the Minnesota Restaurant Association was a neon announcement that it’s never too early to celebrate the holidays and the association’s 2017 slate of honorees. This year’s event was held at downtown Minneapolis’ Lumber Exchange Event Center. Emceeing the annual bash for the second year in a row was Stephanie March of Mpls.St.Paul Magazine and the Weekly Dish on myTalk radio 107.1. Walk-around heavy hors d’ oeuvres, a silent auction and the awards ceremony preceded the real partying downstairs at Pourhouse. Adding to its accolades, Spoon and Stable in Minneapolis’ North Loop was awarded Restaurant of the Year. Chef/Owner Gavin Kaysen accepted the award on behalf of the 82 employees who work there, and who make it so special. He did admit that his young son was going to be disappointed when he returned home with his plaque, because he was expecting his dad to win a helicopter. The Coca-Cola Company, Allied Vendor of the Year. KEYC NEWS 12 (Nov. 30, 2017) – Locals gathered for the Grow MANkato mustache bash. The end of the No–shave November celebration just wrapped up at Pub 500 in downtown Mankato. Many took part in the end–of–the–month shave including our own Dion Cheney. 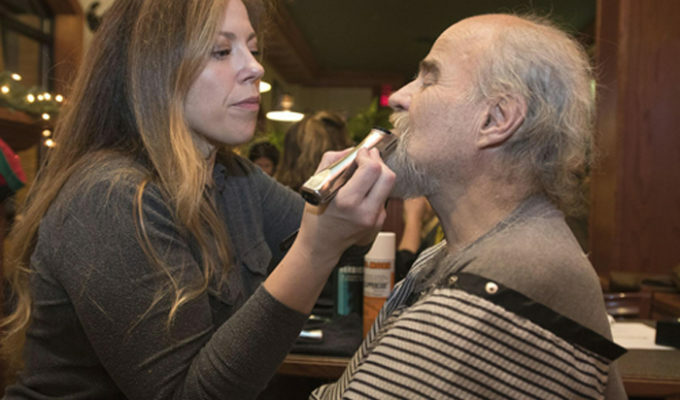 The event included a facial hair competition, live music and gentlemanly games … all in effort to provide awareness for men’s cancer. This is the 4th time Pub 500 has held the event since it began in 2012. Grow Mankato is a grassroots effort that raises awareness for men’s cancer throughout the month of November and all year long. The premise was simple: Erika Boyer-Kern and Nicole Olsen would visit one restaurant each month and then post a review on Facebook with photos of the food and comments on the menu’s vegan-friendliness. They didn’t expect to get wrapped up in a larger conversation about eating habits and changing menus in Mankato. Before launching Mankato Vegan, Boyer-Kern and Olsen regularly met for a beer and a bite to eat. However, the friends often lamented local restaurants’ lack of vegan options, as well as the lack of resources to help people, whether area residents or visitors, find vegan eats. The Facebook page started in 2015 after Boyer-Kern and Olsen pulled up Google, typed in the words “Mankato Vegan,” and hit search. Since launching in 2015, Mankato Vegan has reviewed many local restaurants, including Shogun Sushi and Hibachi, La Terraza Mexican Grill and Bar, India Palace, Pho Anh and New Bohemia. However, one important review happened in spring 2016 when, by a total fluke, they decided to go to Pub 500. They regularly ordered beers there, but a closer look at the menu that day revealed few vegan options — little more than fried pickles and pub chips. Boyer-Kern and Olsen framed the review as positively as possible since they really enjoyed the restaurant and its atmosphere. To their surprise, the restaurant responded. Pub 500 management didn’t get defensive, but instead asked for help. It was already planning to add vegan and increase vegetarian options, and if the Mankato Vegan duo was willing, the restaurant wanted them to try a few dishes. What does going vegan mean? Like vegetarians, vegans eat a plant-based diet. While both do not eat meat, vegans also avoid dairy, eggs or other foods that come from animals. Vegans also do not wear clothes made from leather, wool or other animal products. Many become vegans out of a concern for animals and the environment, according to Boyer-Kern, but she felt that the main selling point was the health benefits. She came across the documentary “Forks Over Knives,” and soon quit meat cold turkey. At the time, Boyer-Kern and Olsen worked together at the Committee Against Domestic Abuse, and Boyer-Kern “brainwashed” her friend into going vegan too. Olsen was already a vegetarian, though, so she didn’t take much convincing. While some say eating vegan costs more, Olsen disagrees. She committed to eating less processed, prepackaged foods, even if they’re plant-based. The ingredients to cook most vegan dishes — fresh vegetables, beans and rice — are inexpensive, she said. “If you’re going to eat all of the (fake meat and dairy) replacements, then it’s going to be expensive. But if you’re eating whole foods, it’s not going to be,” she said. However, the goal of Mankato Vegan was not to try to convert people to veganism. If they want, people can learn about plant-based diets through numerous resources and documentaries, such as the recent film “What the Health,” Boyer-Kern and Olsen said. They hope Mankato Vegan helps people eat less meat, but they don’t want to be “the vegan police,” busting people who eat cheese every now and then. “That stereotype exists. But it’s not something I come across very often, and it’s definitely not how we are,” Olsen said. The two want to build a community of people who already share an interest in eating a plant-based diet — whether they’re strict vegan, mostly vegetarian or just starting a meatless Monday. So far, that has mostly taken place over Facebook. But Boyer-Kern and Olsen hope eventually to host restaurant meetups for people who follow Mankato Vegan. Restaurants throughout Mankato have been adding vegan options in recent years. Mom & Pop’s has started carrying more dairy-free ice creams. Jake’s Stadium Pizza offers vegan “cheese” and crumbles, and is working on a vegan crust. Friesen’s sells vegan cakes, soups and breads. And using that bread, Curiosi-Tea House offers sandwiches with plant-based “meat” from the Herbivorous Butcher in Minneapolis. 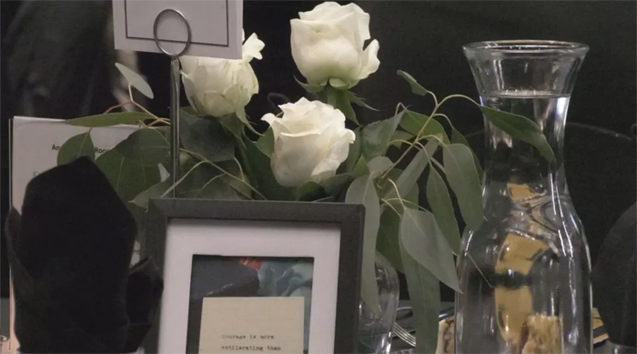 “Tea is such an environmentally friendly drink that it made sense to look at serving foods that are more environmentally friendly,” said Heidi Wyn, owner of Curiosi-Tea. As a vegetarian moving toward veganism, Wyn said she has browsed Mankato Vegan, but it can still be difficult to find options at southern Minnesota restaurants. “Mankato has definitely got better options than even three years ago, but it’s hard sometimes,” she said. Restaurants should listen to vegan customers to create tasty dishes that herbivores and omnivores alike would enjoy, Reasner said. It’s similar to accommodating people with gluten or dairy allergies. There’s always some risk that customers won’t respond to new items, but not because they’re vegan. A burger or steak could flop, too, Reasner said. Based on how well the new veggie items are selling, he believes they’re here to stay. And Mankato Vegan thinks they have a pretty good case for restaurants to keep adding plant-based entrees. When Boyer-Kern and Olsen go out to eat with a group of friends and family, the vegans always get asked to pick a restaurant that will have something they can eat. 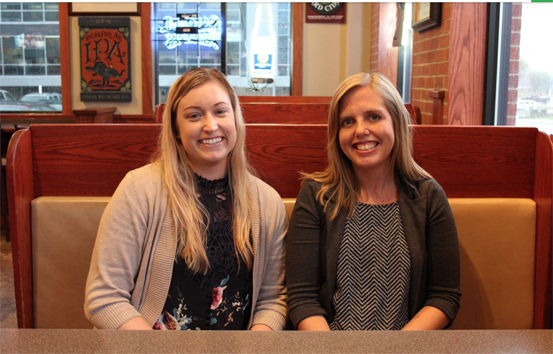 Photo caption: Nicole Olsen (left) and Erika Boyer-Kern launched Mankato Vegan in 2015, and they’ve since reviewed many local restaurants and consulted Pub 500 on menu updates. 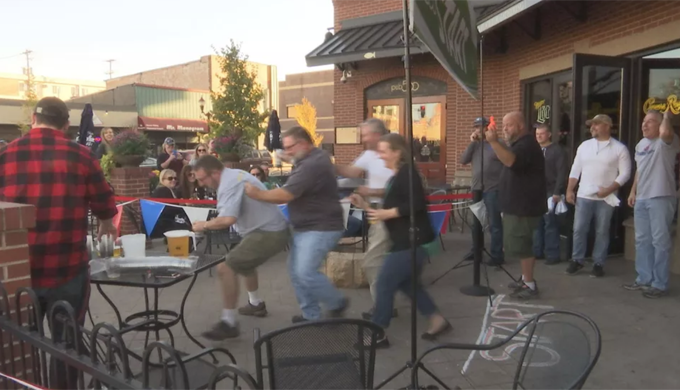 KEYC NEWS 12 (Oct. 19, 2017) – Running and beer enthusiasts came out Thursday for Pub 500’s .005k Pub Run. The race, which is just over 16 feet in length, was put on ahead of the Mankato Marathon and sponsored by Fulton Beer. With a $10 entry fee or $5 with a canned food donation for ECHO Food Shelf, runners got a car sticker, t–shirt, and, of course, a beer. All the money from the races will go to ECHO Food Shelf. 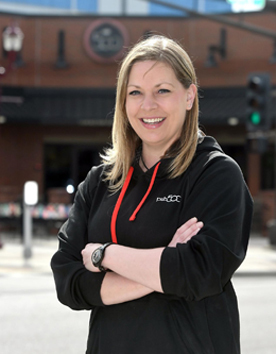 MANKATO FREE PRESS (June 30, 2017) – Tending bar at Pub 500 is so much a part of Erin Filson’s life that she isn’t sure how long she’s done it. Filson remembers starting about half a dozen years ago on Minnesota State University’s homecoming weekend. She knew how to serve drinks, having worked as a country club cocktail waitress during high school and a bartender in a corporate setting. But she didn’t know where Pub stocked things, and relied on her patient coworkers’ help that hectic homecoming night. “That was my introduction to the Pub — sink or swim,” she said. Filson is grateful for owner Tom Frederick, operating partner Jay Reasner, her coworkers and the work environment. It’s a place where her customers can become friends, where she can suggest libations based on each individual’s likes. Pub 500’s atmosphere, she humbly suggested, probably helped her win two years in a row over so many great bartenders. “Everybody on the list, last year and this year, deserved to be there. … To even be included is flattering,” she said. But even the most dedicated bartender needs a break. Filson likes to spend hers on the golf course. KEYC NEWS 12 (March 7, 2017) – As liquor stores begin the adjustment to the new normal, breweries continue to forge their own path. Those attending Greater Mankato Growth’s Business After Hours this evening at Pub 500, the restaurant had a special treat. Welcome to the world of nano-brews. Hosting one of GMG’s Business After Hours events now comes with added pressure. You have to make sure it’s a get together everyone will remember. “We came up with different ideas of what we could do, what we couldn’t do, what would be fun, what would be different – set us apart from everyone else. I wen tot Tim [Tupy] over at Mankato Brewery and we collaborated on some ideas and came up with some different styles of beer,” Pub 500’s Jay Reasner says. Organ Grinder with the added flavors of the restaurant’s Bread Pudding flavors, and Kato Lager infused with Pub 500 Homemade Cranberry Sauce. “It was actually really cool. It was a lot simpler than you’d think, but still a cool process to watch get done. With the bread pudding, you’d think it would be chunky – we left the bread out. Didn’t put the solid bread into it. Just the flavor into the beer itself,” Pub 500 chef Jason Myers said. 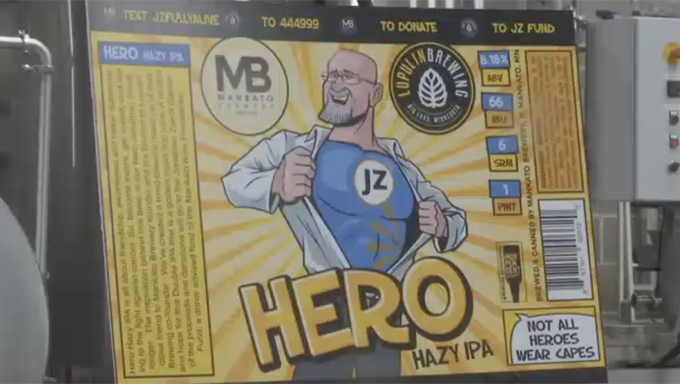 Mankato Brewery has done something like this before. Angie’s Boom Chicka Pop Belgian Style Farmhouse Popcorn Ale. A continuation of the connection between local companies that really gives Mankato its identity. “I think Mankato is a great community with all the different businesses, all the different styles of business – manufacturing to high end anything – there’s so much here. Working together is always a goal of business. It should be. And I think we do a great job as a community of supporting local, supporting each other,” Reasner said. 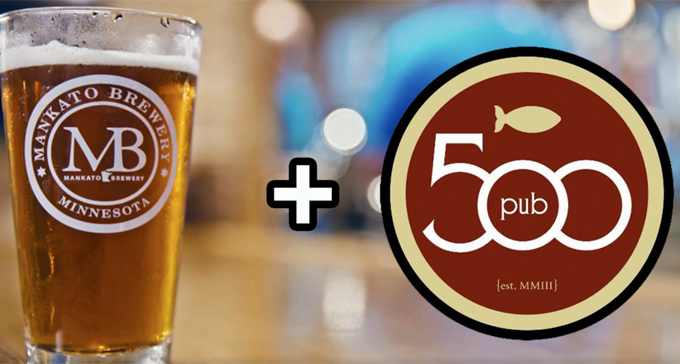 The two beers will be available at Pub 500 until they run out – so if you’d like to try them, hurry!